OUR ONLINE CATALOG and this carved cinnabar inro japanese box page serve as a cross-section of our China exports. Greater variety is available. Email us a photo example of what you seek. Export prices often change. All are re confirmed after your inquiry. You will be emailed a pro-forma invoice offer. Carved cinnabar inro case featuring dragons. Large dragon on both sides of case. Removable lid also has dragons on both sides and carved into top. incn001 $3.75 30 - 2 7/16" x 2" x 1 1/8"
Carved cinnabar inro case featuring bats. Detailed bats and flowers on both sides of case. Removable lid also has bats and flowers on both sides and carved into top. The Chinese character for longevity carved into sides of case and lid. Triple-oval shape. incn002 $3.75 30 - 2 7/16" x 2" x 1 1/4"
Carved cinnabar inro case featuring butterflies and flowers. Detailed butterflies and flowers on both sides of rectangular case. Removable lid also has same theme on both sides and carved into top. 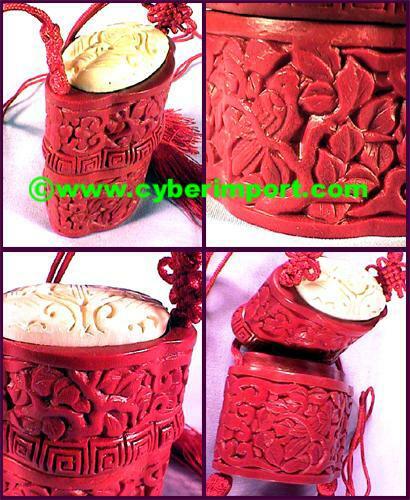 incn003 $3.75 30 - 2 1/2" x 1 3/4" x 1"
Carved cinnabar inro case featuring birds and flowers. Detailed birds and flowers on both sides of triple-oval-shape case. Removable lid also has same theme on both sides. Special oxbone inlay on top features twin bats around the calligraphy for longevity. Unhinged lid is kept in place by red braided cord. The fancy knot designs act as ojimi. Twin tassles at bottom ends of cord. This cord could be re strung using your choice of carved ojimi and netsuke, both of which we sell at auction at in our catalog. Carved cinnabar inro case featuring dragons and flowers. Special, circular oxbone inlays with relief-carved dragons on both sides of rectangular case. Removable lid also has flower theme on both sides and carved into top. 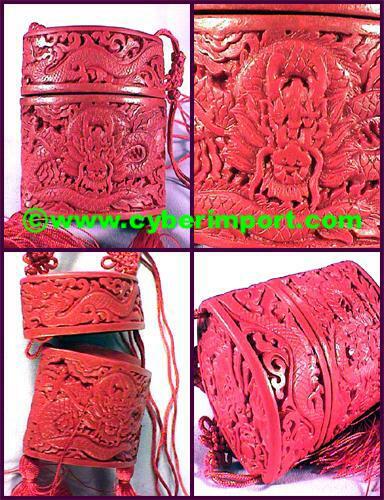 Cinnabar lacquer art carving dates back over two millennia in China. The lacquer itself comes from a native Chinese tree sap. It is tapped much like that from a rubber tree. Mineral pigments such as cinnabar or iron oxide are added to the lacquer for the dark red color. Over a hundred coats of the lacquer can be needed to get the necessary thickness for carving. This is over a solid base body of copper or wood. Because each coat must dry before the next is applied, the painstaking process takes many months to complete a single piece. 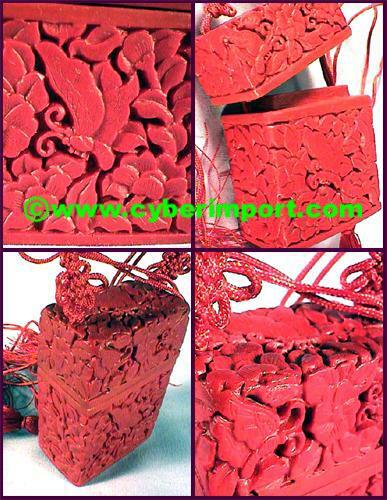 China Factory Minimum Quantity of these carved cinnabar inro japanese box items can be negotiated with factories. Dollar Amount is often more important to smaller factories than the quantity of each piece. 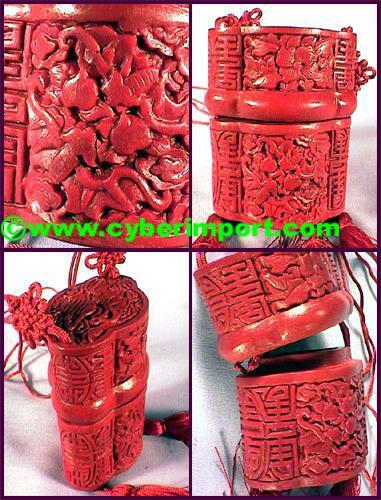 Minimum quantity often can be divided among several carved cinnabar inro japanese box or stock numbers. Please inquire with us about your specific needs for smaller quantities than those listed. Smaller quantity can result in a bit higher price. Ask us for a quote. 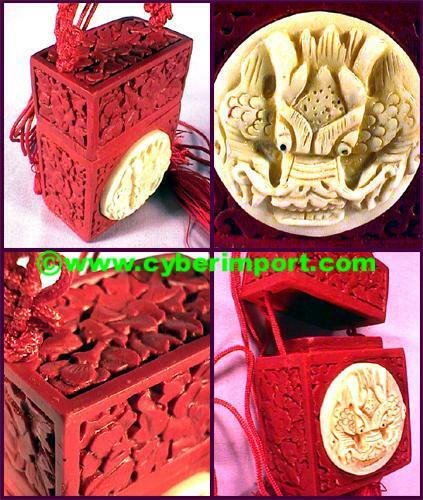 Custom Orders are possible with any of our carved cinnabar inro japanese box products. Send us a .jpg example of what you want. If we don't have it, we can get it.